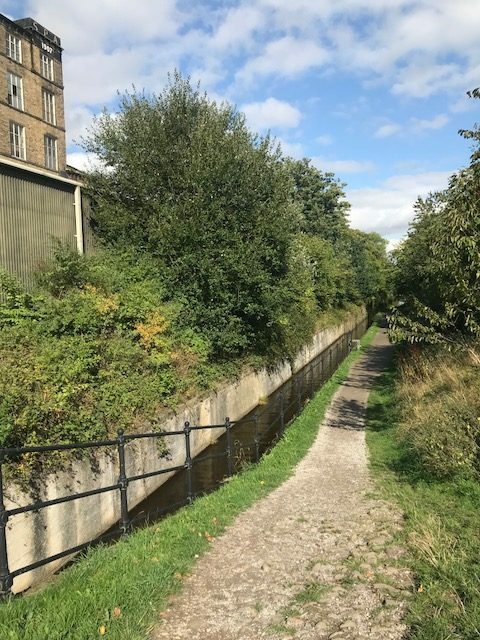 Over the weekend of 7-9th of September 2018 I attended and lead a walk at ‘The 4th World Congress of Psychogeography’ in Huddersfield and the Colney Valley. In the past, psychogeography has been an area often dominated by western, able bodied, straight men. The papers and projects of this conference clearly aimed to challenge and questions this perceived dominance. There where papers on both queer and non-human viewpoints, gender ideas within walking practices, and canine and human collaborative walking, among others. The full programme of the Congress can be found online here. The first day of the conference was a day of presentation and discussions, held in Huddersfield’s University. The second day consisted of walks, events and bus rides, all of which moved the participants through the Colney Valley – practising psychogeography rather than talking about it. Unfortunately, the weather was not co-operating, so the second day took part mostly in a persistent rain, but that, fortunately, did not deter the very determined group of psychogeography conference attendees! My contribution to the conference was a walk called ‘Sonic Margins’, taking place in the village of Slaithwaite. I am a sound artist and my research investigates ‘inner sounds’ – sounds we hear as part of our inner world of thoughts, emotions and desires. The overall theme of the conference was ‘Vague Terrain’, and I wanted to consider what a sonic ‘Vague Terrain’ would be, in the context of space/place. Designing a listening walk where the focus is ‘inner’ or imagined sounds presented me with a few problems. Firstly, how do you get people to listen? Mostly, we are so preoccupied with the visual, the aural takes second place (if even that). 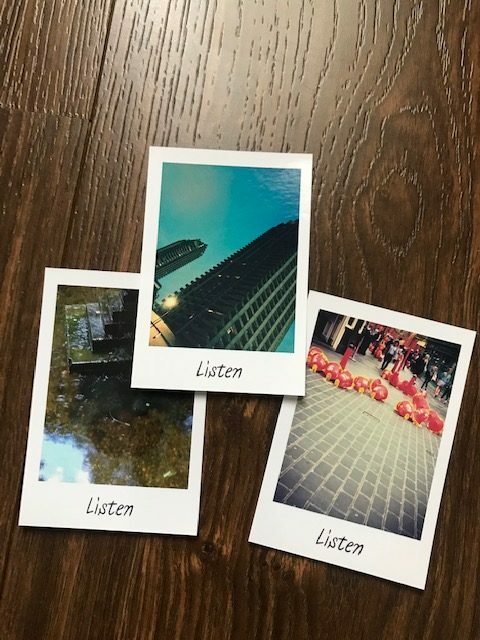 To refocus the participants attention towards the aural, I decide to start the walk with a short listening exercise, using photographs as a sonic trigger. 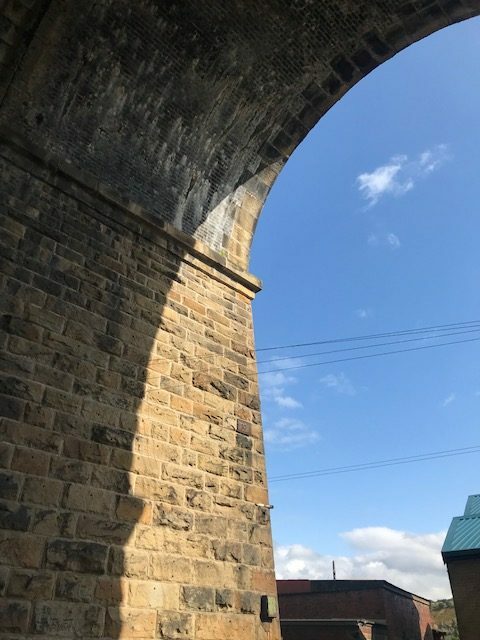 I also did not want the walk to be to long, as I wanted to keep the focus on listening and avoid lengthy periods of walking, which would distract from the main aim of the walk – exploring a Sonic Vague Terrain. 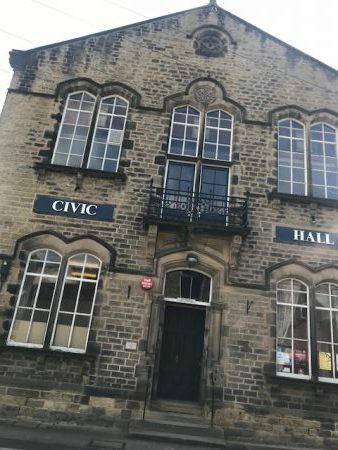 Based on this, I designed a short walk, starting at our base, the Civic Hall in Slaithwaite, a lovely old building where the group of conference attendees gathered for some lunch before heading off for the various walks and events taking place in the village, stopping at 3 different places in the village, before taking us back to the Civic Hall. Considering listening as Vague Terrain means more than imagining the sounds of the past or the future. Can we, through listening both outwards and inwards, access thresholds of space, sound and experience? Can we access a deeper level of listening, one that considers our inner experience, perhaps other people’s experiences and the affect of this listening on both the landscape and the participants? We walk down a small side street in the rain. The mill looms large in front of us. It is a working mill, but it is a Saturday, and everything is quiet. We stop near the stream, which use to help power the mill. I give each participant a prompt to listen to. ‘sound of strength/sound of despair/sound of resilience…..’ Everyone finds their own space and the group falls quiet. Sounds start to emerge. Water. The bells of a distant church. Far off traffic. Slowly tuning in to other sounds – the deafening sound of working in the mill. The undercurrent of sound in ideas of strength, resilience and hardship, thinking of the women working in mills. The group slowly gathers together again and we collective decide to move on. We walk up a step slippery staircase just behind the train station. We follow a small path on a sloping hillside. Trees and undergrowth are thick and green. On our left side is a low stone wall. We come to a place where the wall has collapsed, scattering stones across the path we are walking on. 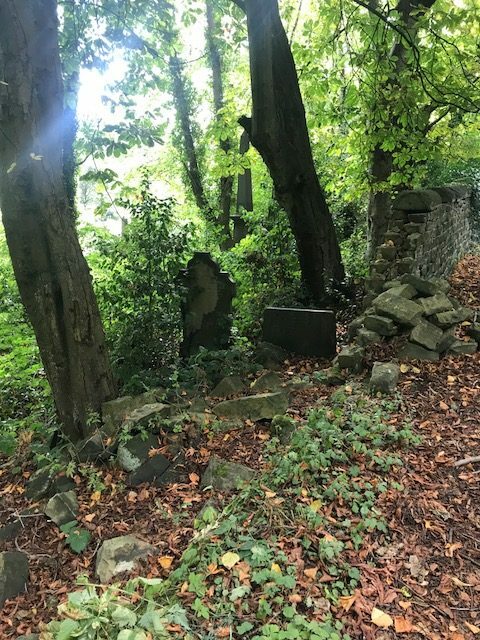 We stop and look towards the trees, and realise we are looking at a graveyard, the trees and undergrowth hiding a scatter of old gravestones. We stop and listen, some people moving further along the path. The rain is still falling, dripping through the trees, slowly. 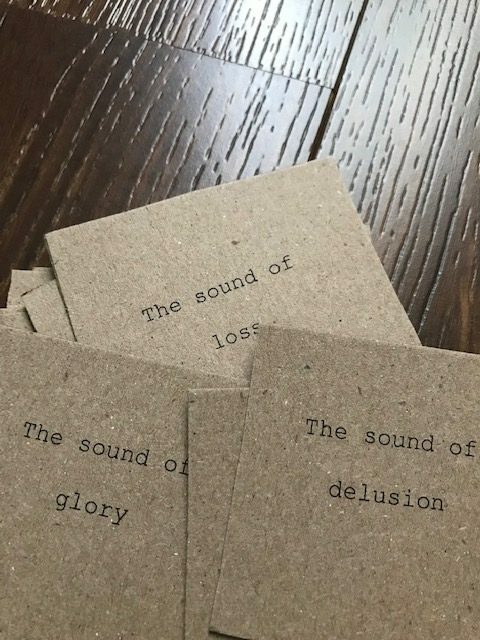 I distribute my last suggestions for sounds ‘sound of transcendence/sound of fear/sound of death’. The sound of the trees is gentle and persistent. Other sounds seep through. The vast sound at the edge of consciousness accompanying the idea of a different world, a threshold, a passing through. A bird takes flight among the trees. The walk is finished, and we gather together again, heading back to the Civic Hall. This was the first time I have attempted to introduce ‘space’ or ‘place’ into my practice exploring inner sound, and although the walk went well, there are a few things I have reflected on which I feel I could develop. As I was designing the walk, I considered whether it would be useful to mention or introduce the ideas which had influenced me choosing certain locations and what had influenced my prompts. In the end I decided against it, wanting to keep the experience as free from ‘interference’ as possible, allowing instead for a ‘personal’ listening experiences. Where I to do this walk again, I would involve the participants more in this process of personal contextualising. Private, personal listening experiences are, of course, fine. If you want to explore listening as a ‘Vague Terrain’, however, the concept of going beyond your ears, perhaps even your own, contained sense of self, is important to consider. One way of ‘opening up’ the listening experience would be to consider the other members of he groups, what they hear and if we are listening towards the same thing – the past, the future, the imaginary. In developing this walk, I will push further out into the sonic vague terrain, readapting the walk to other spaces.